"Economic Advantages of Open Architecture Platforms In NFV Deployment"
The imperative for communication service providers to embrace more agile service delivery platforms that help them become more continuously innovative is compelling and widespread. Having proven the essential functionality of numerous types of network appliances and applications in lab tests and trials, it is now time for operators to put the platforms to use in progressively larger deployments and determine how well they can meet their goals. 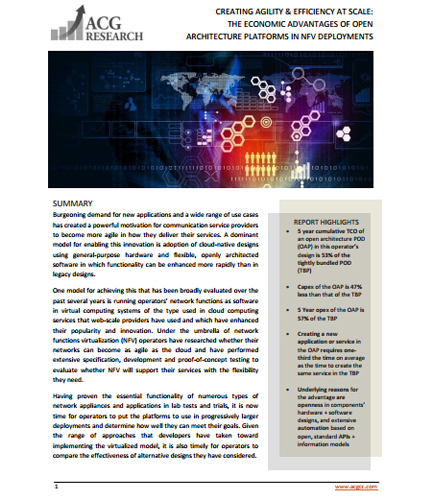 This whitepaper provides an analysis of the nature of architectural transitions such as NFV in service providers’ environments and its strengths in determining the economic advantages on cost and revenue-generating aspects of designs. A partner portal provides your channel partners with easy access to critical elements that will help them close deals faster. It plays a key role in helping you maintain your partner relationships better. Each channel partner is unique; so are their requirements. So, how can you bring them all on the same page as you? This whitepaper discusses the 9 Must-Haves for an Excellent Partner Portal that can help your channel partners succeed. It also addresses questions like: What do your channel partners really want in a partner portal? What are the things to consider when investing in a partner portal? How can you make the most of your investment in a partner portal? What are the key requirements of a perfect partner portal to improve partner adoption and usage?